I went for a walk in the glorious sunshine down our high street this morning. The trip was to get some brown dye for some wool crepe so I can cut out a skirt I want to make. Anyway, I got distracted by these few things. 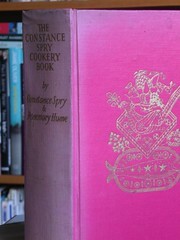 The Constance Spry Cookery Book 1956 2nd edition. It’s a wonderful compendium of classic recipes and I believe was used as reference for Cordon Bleu. I just love the gold embossed cover and it’s a shame the spine has bleached the candy pink colour out. It has wonderful sections like force-meats, farces & stuffings and devils, barbecues & marinades and explains the differences between your duxelles, mirepoix and brunoise and relays in detail ‘how to take care of your fat bath’! Wonderful stuff. 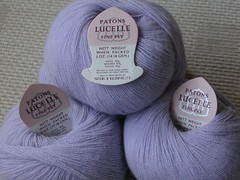 It might even get Mapman interested…..
Mauve is not a favourite of mine, so this vintage Patons Lucelle may get dyed at some point. It’s so very soft – a wool/angora mix and complete with original cards. I’ve not used 2ply before but it’ll be destined for something baby related. The Twilleys Crysette is a vintage cotton. I scored 11 of these 25g balls and look forward to getting my hand s on the Kool-Aid an American friend got me on a recent trip back home. I should be in receipt of that tomorrow.